The 2017 Mod Super Cup Mod Contest begins with ten fantastic Medium Mods including a counter mod, dinette mod, platform mod, secret vault mod, and more. Welcome to the November 2016 Monthly Mod Contest. Please review the following ten Medium Mods and vote for your favorite mod. We will announce the November 2016 Mod Contest winner next week. For more information about the Monthly Mod Super Cup Series Contest, including how to enter, click here. Our dining table was a bit too low, especially after adding memory foam to the seat cushions. The table edge was also too far away from me to work or eat comfortably. 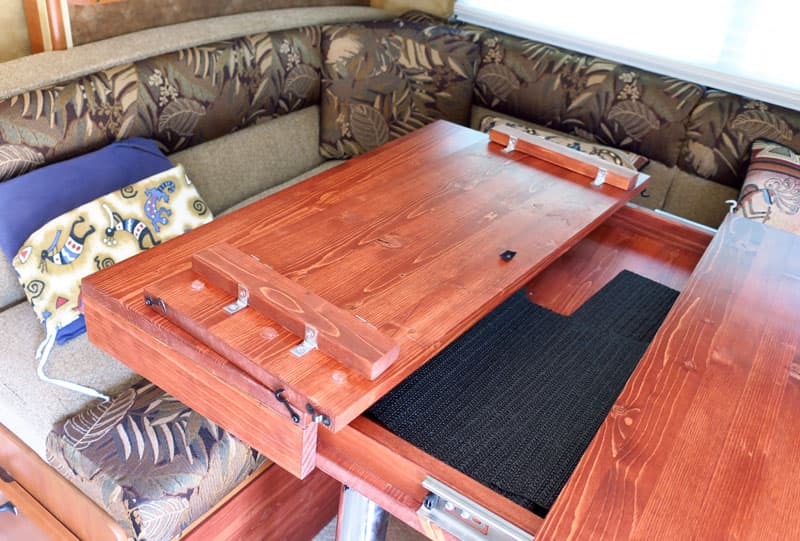 I needed a solution that would not only raise the table, but also make it closer when I needed it to be without making it impossible to get in to and out of the dinette seat. We created a box for the base of the table that is about 1 ¾ inches deep, and the approximate size of the original table (24-inches by 30-inches). We then ordered two sets of 8-inch long drawer slides and attached them to the sides of the table base box. 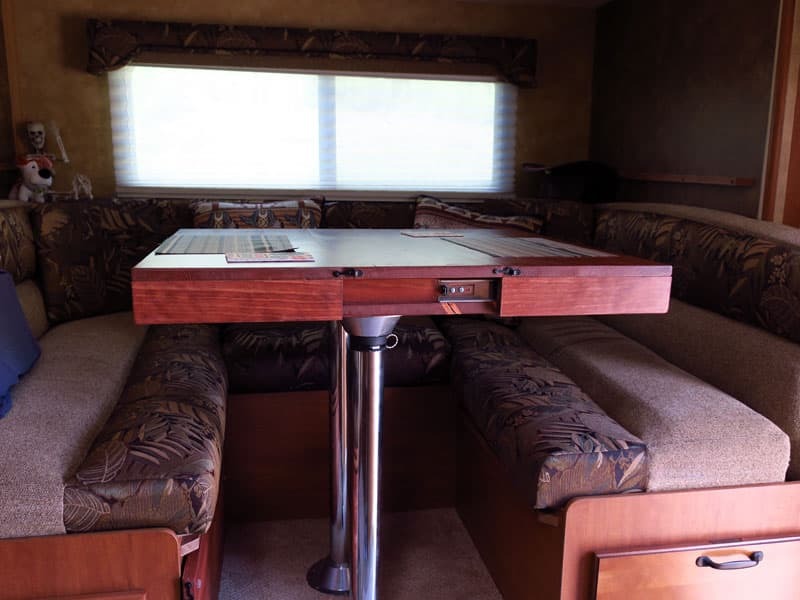 For the top, we used two 30-inch by 12-inch boards and attached side skirts that serve as attachments for the outer half of the drawer slides. Finally, we cut a 10-inch and a 12-inch leaf. We have found we don’t use the 12-inch leaf as much. To the leafs we installed rubber bumpers to make them the exact same height as the table top when placed over the box top. 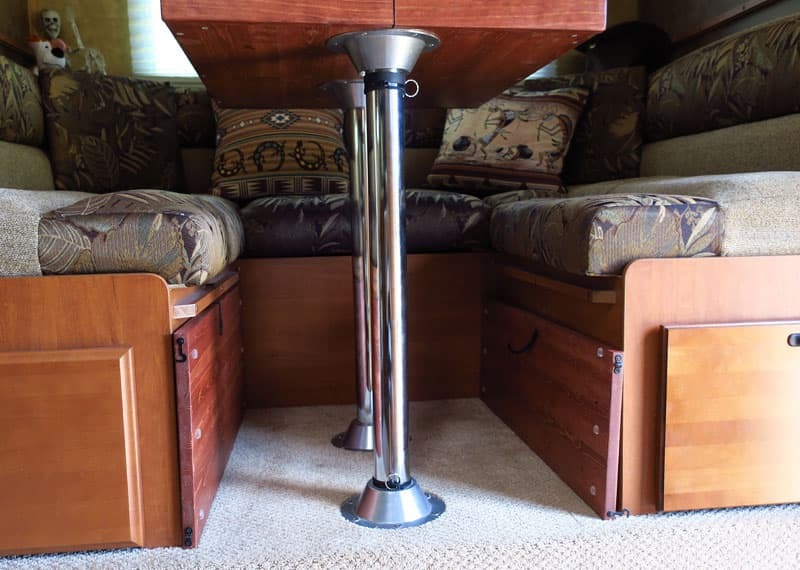 To hold the table and leaf in place when in use and traveling, we put latches on all of the edges. This modification turned out better than we expected! I can put the table as close to me as I need, and my husband is still comfortable on his side. We have much more table space, and the storage created under the table top in the box is perfect for phones, tablets, chargers, placements, and other items. 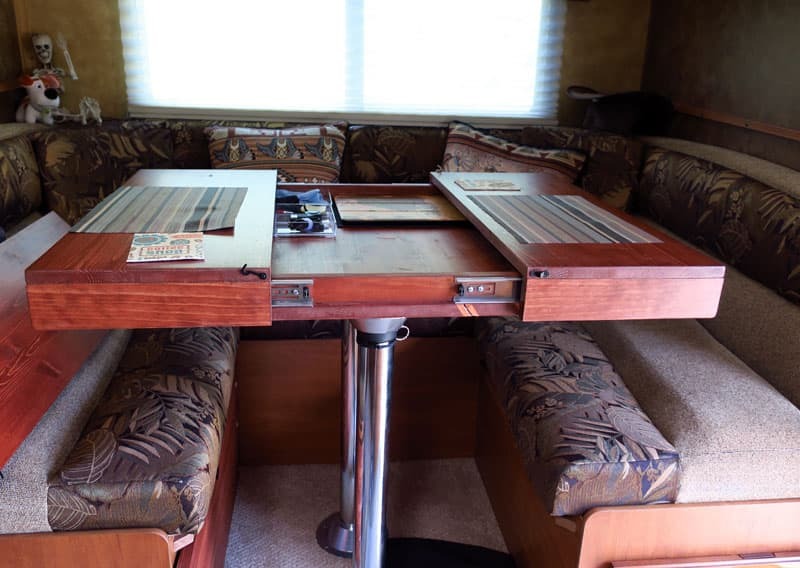 When we want to watch a movie on the iPad on the table, we just take out the leaf and have tons of room to sit and put our legs up on the benches of the U-shaped dinette. 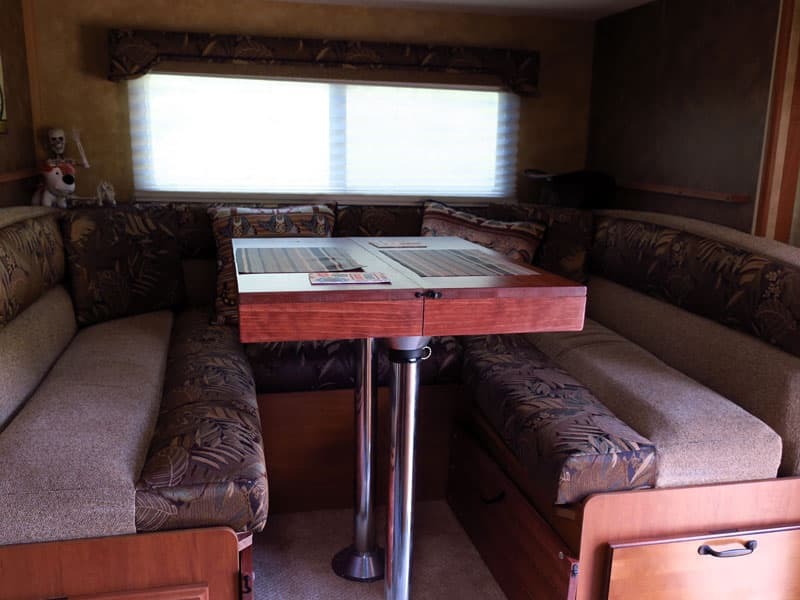 Each leaf stores nicely under the dinette. You’d really never know they are there. It took me at least twenty hours (including problem solving and actual construction) to complete this modification and cost me $125. In my opinion, the skill level of this modification is medium.